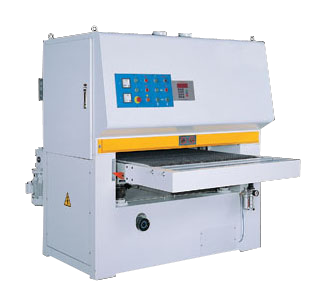 Sheng Yu Machinery Co., Ltd. is a well-recognized heavy duty belt sander manufacturer and supplier in Taiwan. Our entire heavy duty belt sander comes with high quality, excellent performance, advanced technology and competitive price. If you would like to learn more the details, please browse the following categories and feel free to inquire. The main frame is fabricated of heavy duty-steel plate and ribbed to minimize vibration and deflection. All operating controllers are centralized in a convenient control panel. Large, clearly identified and color coded push buttons simplity set up and start-up. Maintains constant check during operation to indicate percentage of full load on motor. Conveniently mounted for immediate readour. Large mushroom push button on control panel provides immediate stop control of all operating systems. Heavy-duty rugged support of sanding gead drive motor. Horsepower of motor directly related to size and perfomance requirements of specific unit ordered. Carefully designed and balanced to insure precise, chatter-free sanding. Covered with proper durometer rubber for each application. Spring loaded pinch rolls are mounted at the infeed and outfeed of the machine to insure positive feeding. The hold-down plate is hard chrome treated for maximum wear resistance. Sanders have variable feed speed as standard equipment. It accuratedly display the position of conveyor table.